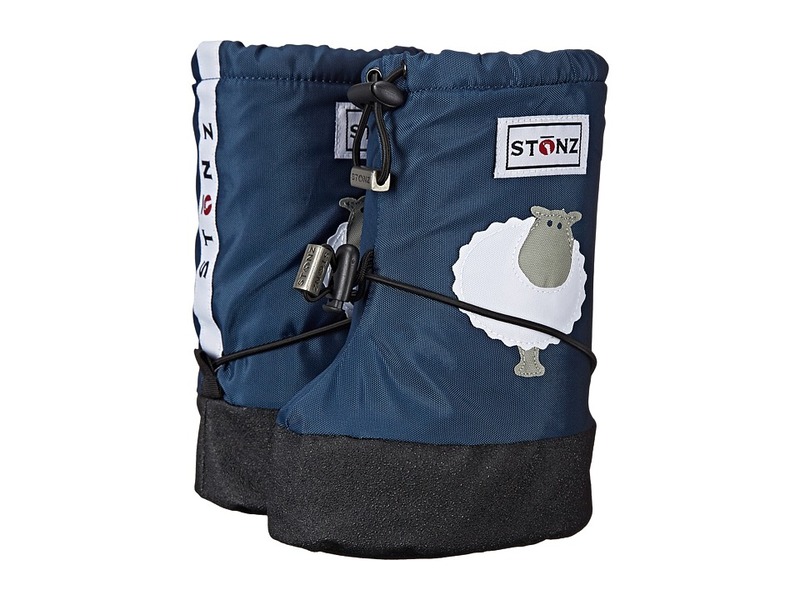 Even the rainiest days won~t ruin their outdoor fun when they wear these adorable Baby Booties from Stonz! Water and wind-resistant coated nylon upper. Fleece lining for added warmth. Can be layered up or down to accommodate any season. Two bungee toggle closures at the top of the shaft and midfoot provide security. Wide opening easily slips on over outwear. Flexible textured soles allow feet to feel the ground and are skid resistant keep kiddos steady on their feet. Please note: the size small has a soft sole and medium and large have a hard sole. Machine wash and dry, inside out on the delicate cycle. Measurements: Weight: 3 oz Circumference: 12 in Shaft: 8 in Product measurements were taken using size LG (US 8 Toddler), width M. Please note that measurements may vary by size. Weight of footwear is based on a single item, not a pair.